With Hold&Release you have early access to quality assure the publication and check content on all available platforms before the publication is released to the readers. If necessary the publication can be reprocessed several times. Simply deliver new pages to Visiolink ftp, and the paper will be reprocessed automatically. The publication will be put on hold and released automatically at the agreed release target. 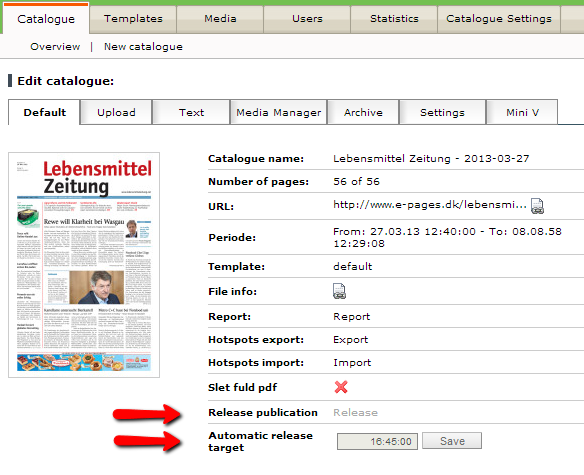 If you wish to publish your publication before the agreed automatic release target, you can release the publication manually. Go to http://admin.e-pages.dk/access.html and log in to Visiolink’s system.